Open data policies which allow government agencies to share public information with citizens and the private sector have made California welcoming to startups dedicated to helping communities recover following a disaster.For example: Appallicious offers an app which allows subscribed cities and towns to select from hundreds of data sets, then share with the public, information on evacuation routes, current hazards, and location of critical resources.BlueLine Grid allows public employees from different agencies to communicate with each other during a crisis.SeeClickFix is connecting residents to their local government. Communities across the country are exploring medical registry systems as part of their emergency preparedness plans. Using medical registries for emergency planning has been critical for New Orleans city officials, especially after Hurricane Katrina.St. Louis deployed its Functional Needs Registry after a power outage occurred in 2006. Experts note, though, that just because residents are listed in the city’s registry does not mean that help and services will always be delivered during emergencies. During his semester project in Computer Science at the École polytechnique fédérale de Lausanne (EPFL), Jonathan Cheseaux developed a system for locating a person via his or her mobile phone with a drone. This device could be used to find victims in natural disasters. Scientists and technicians who work at volcano observatories in eleven countries visited the U.S. Geological Survey’s Hawaiian Volcano Observatory earlier this month to learn techniques for monitoring active volcanoes. The International Training Program in Volcano Hazards Monitoring is designed to assist scientists from other nations in attaining self-sufficiency in monitoring volcanoes and reducing the risks from eruptions. Speed and timeliness is instrumental to saving the life of a victim of cardiac arrest, so Santa Clara Countyagencies have adopted PulsePoint, a free mobile application (app) which uses location-based technology to alert CPR-trained residents and bystanders if someone in their immediate area is experiencing sudden cardiac arrest. Once alerted, residents can decide whether they are available to reach the victim and begin resuscitation until official emergency responders arrive. 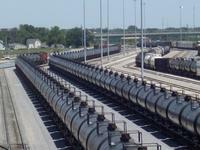 Last month the U.S. Department of Transportation(DOT) ordered rail carriers with trains carrying crude oil to notify state officials in the states through which the trains pass about the volume, schedule, and routes of these trains. The amount of crude oil transported by trains has grown dramatically – from 6,000 carloads in 2005 to more than 400,000 carloads in 2013. The increase in the volume of crude oil shipping has been accompanied by a sharp rise in the number of accidents and derailments. DOT’s order was meant to allow states’ first responders to be prepared, but the railways treat shipping information as “security sensitive” and refuse to share it with states’ officials unless the information is distributed to emergency response groups for planning purposes only. Washington State says that state laws require that such information be made public. Rio de Janeiro is one of the most densely populated cities in South America. Much of the city is vulnerable to flooding, and about three-quarters of Rio’s districts have areas at risk of landslides. High temperatures can make living situations unbearable. In addition, a high crime rate and poor infrastructure make the city difficult to govern. In preparation for the 2014 World Cup and 2016 Summer Olympics, authorities are looking to improve response times to disasters and establish a more efficient system to deal with the city’s many challenges. One of the solutions is a high tech integrated urban command center — Centro de Operações Preifetura do Rio de Janeiro (COR) – which unites Rio’s thirty departments and some private suppliers in a single monitoring room where operators can track real-time conditions of the city and coordinate a response to emergencies and disruptions. Adding to the rising number of U.S. cities that accept 911 emergency texts, North Texas public safety agencies will now institute the procedure at their response centers. 911 emergency texting not only helps the deaf, but it better caters to younger generations that do not recognize as much the divide between text and voice communications. The texting of additional media such as photos before the responders reach the site could also have a profound impact on the development of an emergency situation. Connecticut House Bill 5531, if passed, would authorize the towns of East Lyme, New London, and Waterford to establish a municipal body to operate all 911 call centers in region. Creating a unified authority will allow for more efficient dispatch operations, reduce operating cost among the three towns, and will also equalize the towns’ liability should a lawsuit stem from a 911 call response. Critics disagree. If entire mountain slopes start to slide, danger threatens. It is not always easy to predict and monitor these mass movements. In an international project, scientists combined numerical models with microwave radar systems in Northern Tyrol — with promising results. The Steinlehnen slope in Northern Tyrol (Austria) started to move in 2003. Rockfalls threatened people, streets, and buildings. Meanwhile, peace has returned; although the slope is merely “creeping,” Steinlehnen has become an interesting research object for scientists in recent years. For the person buried under the weight of an avalanche, each minute is precious. A person saved from the snow mass within fifteen minutes has a 90 percent chance of survival. After forty-five minutes that chance has diminished considerably. Researchers develop an app that makes it possible for skiers with smartphones to find people buried in the snow. Not a winter goes by without an avalanche incident. In the search for those buried beneath the snow, every second counts. On average, rescuers have fifteen minutes to recover victims alive. This is why an avalanche transceiver is an essential piece of kit for anyone spending significant time off-piste. These transceivers do not come cheap, however, ranging in price from 200 and over 500 euros — perhaps one reason why many walkers and skiers still do not carry one with them. Now smartphones equipped with functions of an avalanche transceiver should help locate the victims quickly.